The JTS and I have been at it again. We’re getting pretty good at putting together recycled aquarium stands and salvaged wood. I painted the table top with Black Dog Salvage Furniture Paint, color Roanoke Rain. A couple of weeks before Christmas I received what I call “Happy Mail”. It was a box of Black Dog Salvage Furniture Paint samples from Woodcraft. I love trying new paints and I really love free stuff. You guys might remember this aquarium stand from my favorite junk shop. 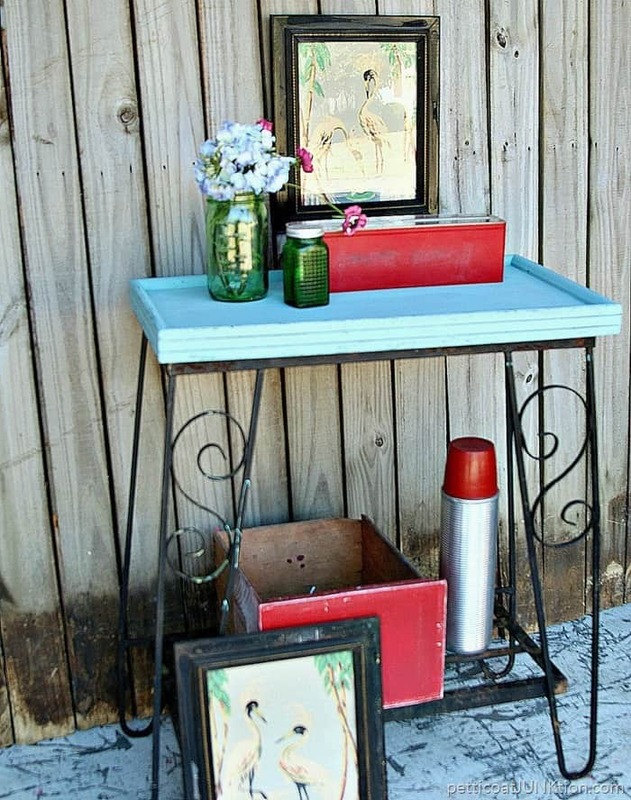 This is the third one I’ve picked up while junkin’. 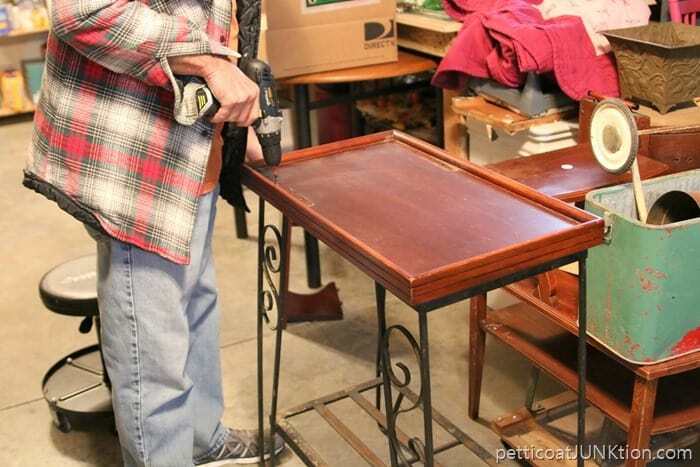 We took apart a table the JTS bought at auction and used the wood top for this project. The JTS (aka, Junktion Technical Specialist) drilled holes in the metal stand then attached the wood top to the stand. He also puttied over the holes. 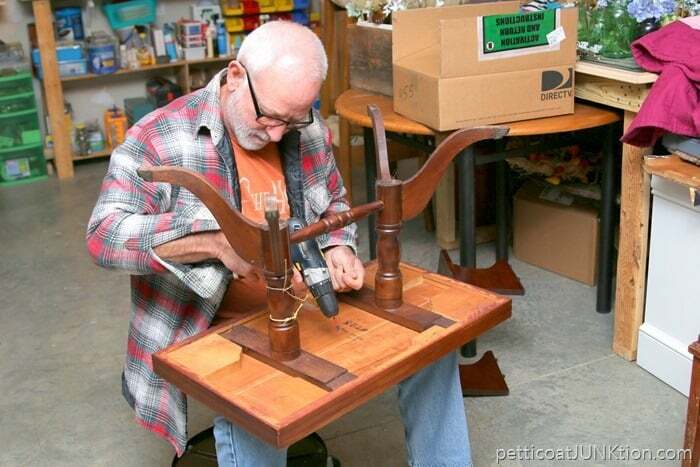 He gets a little carried away with the wood putty. 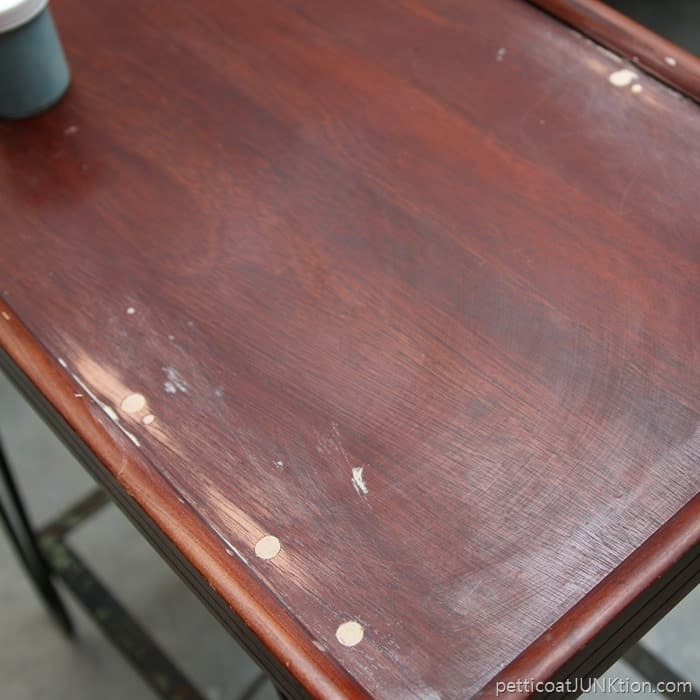 After I sanded the putty…..by hand…… forrreeevvveeerrr ……the table top looked like this. 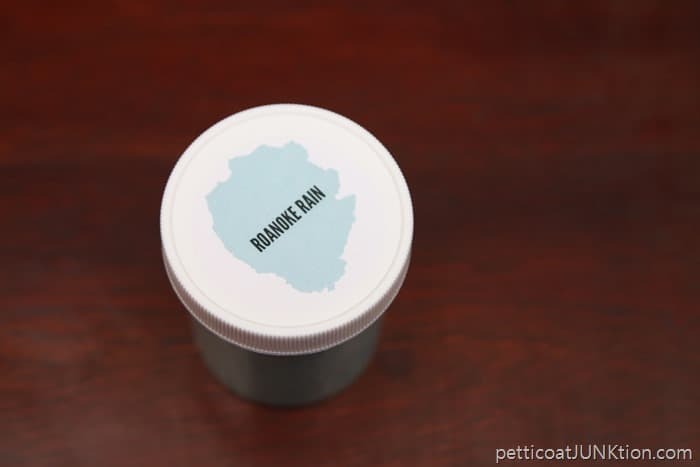 The sample jar of Roanoke Rain. The paint covers very well and the jar is still almost full after finishing my small project. I applied one coat of paint then did a little touch up where I missed spots. 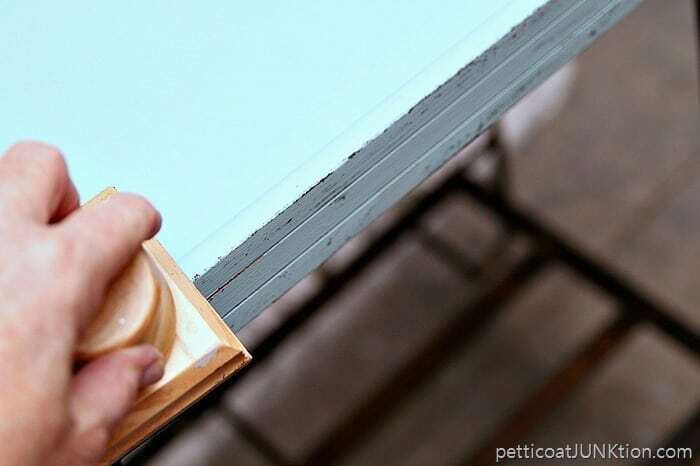 The paint is self leveling and I couldn’t see a single brush mark when the paint dried. 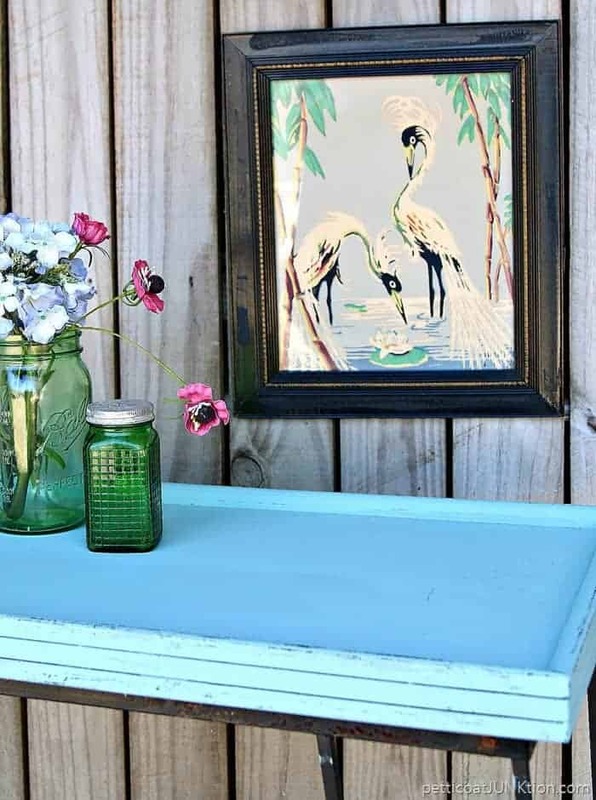 I used my FolkArt layering block with another of the paint samples, Black Dog, to make the top look distressed. This process took about 2 minutes. I love the layering block. 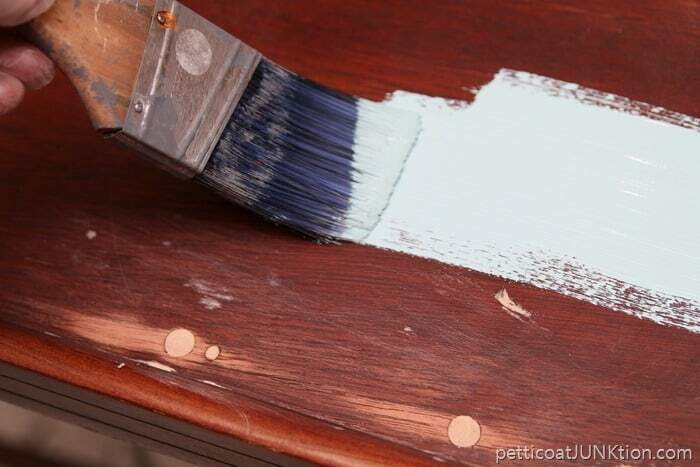 The black layered over the blue really makes the table look distressed. 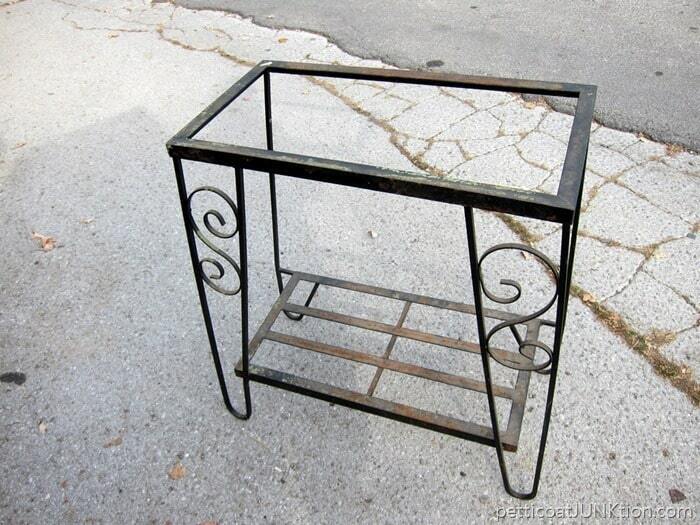 I applied two coats of wax to the rusty metal stand. If you look closely you can see that the table top is just a bit whopperjawed. The aquarium stand was slightly twisted but we couldn’t really tell that until the top was attached. Oh well, it’ll do. 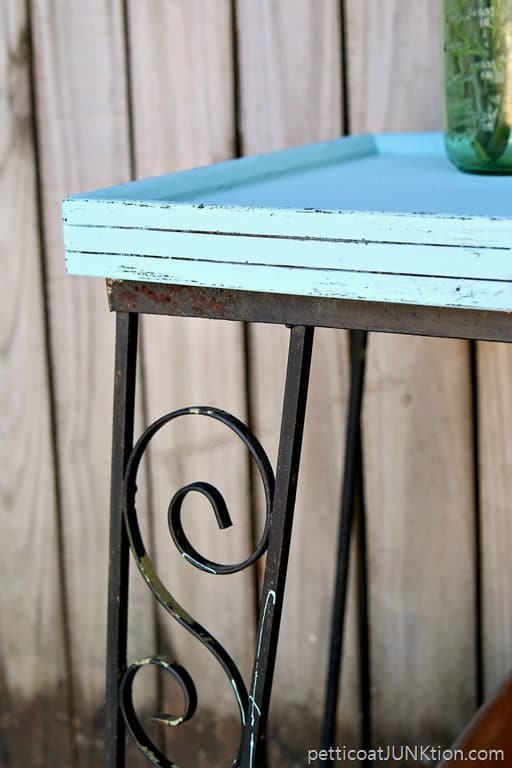 The little table is darn cute. I like the paint a lot. As I mentioned earlier, the paint is self leveling and covers well with one coat. The two bird prints are from my favorite junk shop. Love the muted colors. This is reclaimed table number one for the week and I have reclaimed table number two for you tomorrow. What do you think of the table? Do any of you watch the TV show Salvage Dawgs? 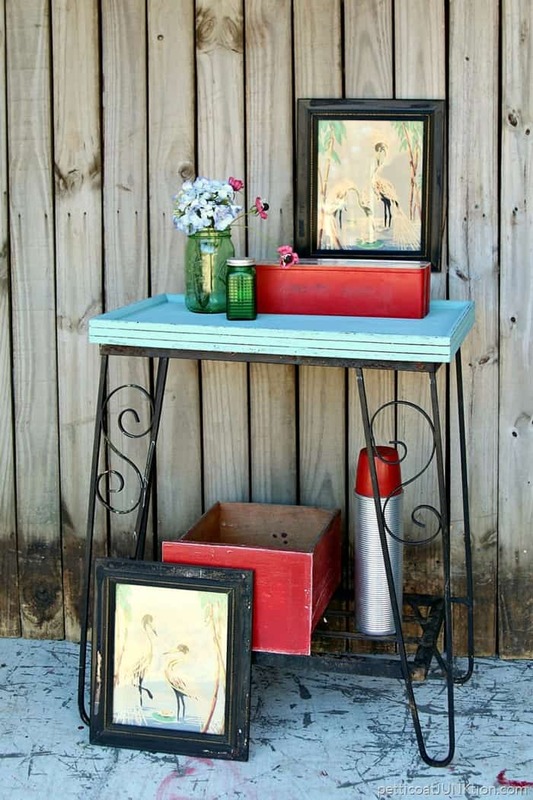 I enjoy seeing what those guys salvage and what they create every week. They’re pretty funny too. See you tomorrow. Have a great day. Another great makeover, Kathy with that classic pop of color you always inject into your pieces. 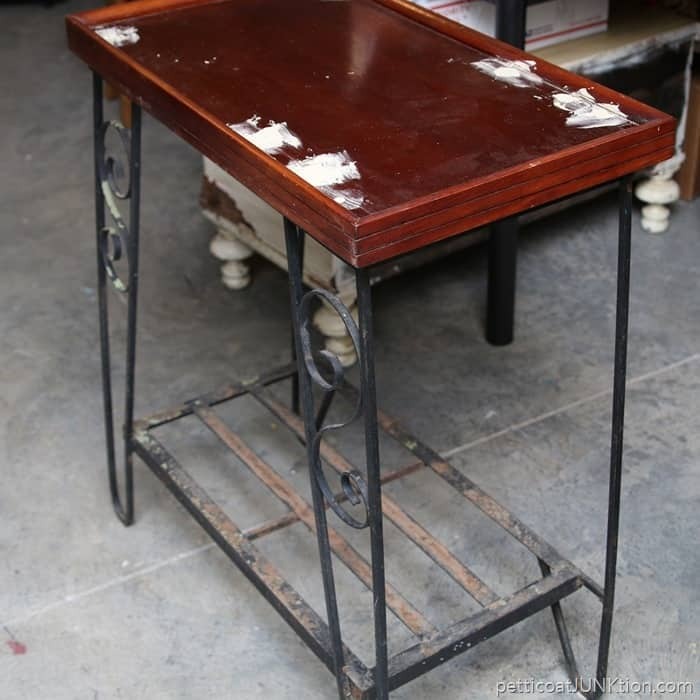 Are the paint splashes on the table legs from you, or were they already there? I imagine you left them be on purpose. Hi Gloria, I can always count on you to look the photos over closely. I did leave the paint splashes on purpose. I noticed I got a little messy and dropped some paint on the black metal base but it looked good so I left it. Happy New Year! Very cute and I love that it is an old Florida style. I think the table is really cute. I love that shad of blue. I live in Roanoke and visit Black Dog on a regular basis. Amazing store! I”m jealous Nancy! Do you ever get to see the whole crew. Mike is too funny. He’s my favorite.